Monasterio Montaneta makes Tenerife holidays unforgettable. 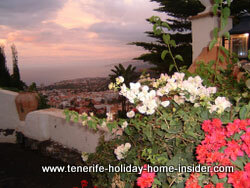 The Monasterio is a term used by expats of Tenerife insiders. of los Realejos by the locals. However, it is a proper attraction of Puerto de la Cruz; it takes only 2 or 3 minutes by car to get to it from the top of the street Carretera Las Arenas. Charming history of the place in a shoe string. 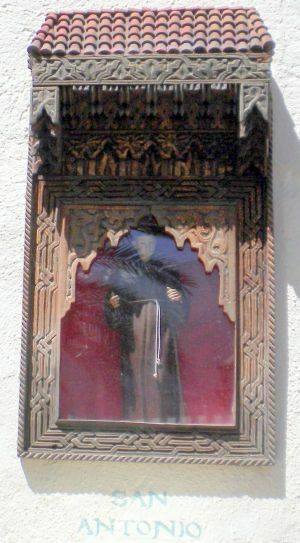 San Antonio shrine as Metaphor for Antonio the Gomeran. Initially, the Monasterio Montañeta was only a large Finca a farmstead with parts that resembled a monastery. Antonio the Gomeran a shrewd monk founded it, more than two centuries ago. All lay brothers and other clergy of the region as far as Candelaria knew that he had it constructed in honor of the patroness of the Canary Islands the Black Madonna. Humble monks also found refuge there later on, as has been testified here. However, the much applauded theme of a monastery was created by an excellent local architect for and on behalf of German business people of Puerto de la Cruz by name of Columbus S.A. The so called Mesón Monasterio the biggest building by the entrance gave the park its official name. Tinerfeños love this and everything around it for family holidays or for afternoon trips on week-ends. Realejos park for children and adult fun. Going to La Montañeta with its small medieval monastery section is today one of interesting attractive Tenerife things to do. Small children adore to run around the gardens with poultry, baby chicken, peacocks, ducks and swans. Only the ponies and rabbits are fenced in. Look out for one particular rabbit, which is very cute... Actually, I was mistaken about goats. The German owners are very unlikely to keep such animals. three minutes from the biggest Orotava shopping center la Villa Alcampo at 15 minutes by cab (cost about € 6,-) from Puerto de la Cruz. The Titsa bus 352 from Puerto Cruz also connects. Total terrain is 100 000 square meters or 25,71 hectares, much of which is virgin land, hence the ideal nature reserve. Little ponds within this farm park contain gold fish or Koi Carps as well as water tortoises. It's very pleasant to watch them on a hot summer afternoon. 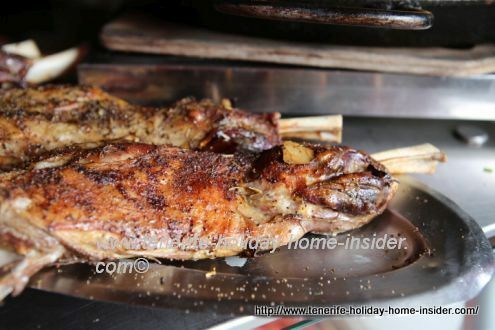 I love to have typical Tenerife food like Conejo (rabbit) and local red Aurotava wine, there. All tastes very good surrounded by unspoiled country air in the semi shaded main patio restaurant of the Monasterio courtyard. There, Tilandsias that grasp their plant energy from air and sun cling to tall palm trunks. While spoiled by attentive waiters you will be delighted by the sight of abundant pink Bougainvillea, Geraniums and Ivies. You will discover colorful tiles on walls and typical rural gadgets in all kinds of nooks. Several restaurants to take your pick. Meson el Monasterio with one of its many restaurant options. Tenerife eating out at the Monasterio. 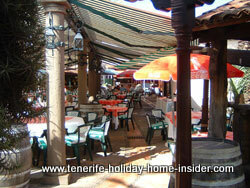 Eating out in this place with four large restaurants and several bistros and/or bodegas is a Canary Island treat. 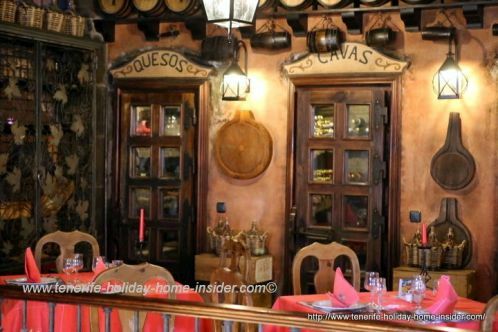 Also, the indoor restaurant next to the main patios has countless private nooks that all have a character on their own. Now open to the public since 1993, this estate of Los Realejos may be enjoyed for great scenic walks with ocean views where a big part of La Orotava valley can be seen. 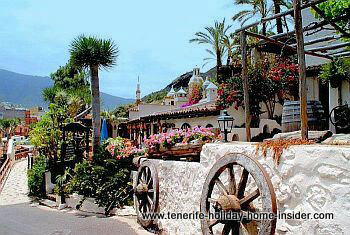 The typical Tenerife details in this oasis are Tenerife culture features worthy of museums. The amount of cars that you often see in its car park which has space for 200 proves that the Monasterio is not only popular for Tenerife day trips but, also at night. When I took my daughter there on a mild January winter afternoon she classified it as one of Tenerife attractions made up as theme park on the island which is not to be missed. 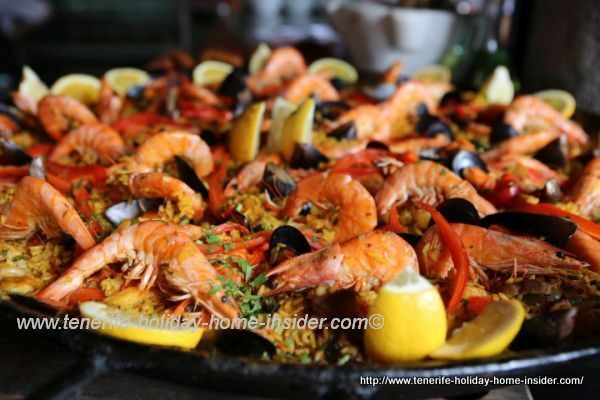 You may do a trip to La Vera's Montañeta any time of the year. Montañeta with popular champagne breakfasts. By the way, the main patio restaurant is a good spot to meet friends for Sunday champagne brunches. Last built was Restaurante El Mirador for eating out with views to kill for come rain or shine. Did you know that the name Mesón represents two restaurants above the San Pedro Monastery Bodega and Lagar by the park entrance? Mesón which you often see added means huge house and that's exactly what the Montañeta's number 1 eating place looks like. 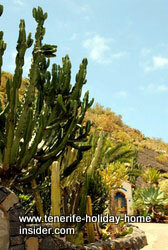 Nature reserve entrance of the Monastery Park of Tenerife. The area below the protected terrain of the Monasterio park on the foot of the the mount was turned into a natural park by introducing more plants and trees. The ones which are not indigenous are drought resistant. Never would the monk have believed that this small mountain Montaneta would one day be declared geologically protected area in Tenerife which is documented at the Los Realejos town hall. This almost free standing estate with its fairly sized volcanic cone was not in danger during the 2007 August wildfires, by the way. With its roundish shape La Montañeta of the monks looks just like an over-sized Mount of Pueblo Indians of America. The volcanic elevation is very typical, but not unique on Tenerife Island for its shape. It's a green landmark with a white little chapel on top. One can see it from far from the TF5 free way or, when approaching from Los Realejos. It is spotted from as remote as the Mercedes forests, from La Orotava and, of course, from many areas in Puerto de la Cruz. Hotel on top of a mountain. The Montaneta of Monasterio is not to be mistaken by the similar looking green elevation in its neighborhood by the Free Way which is crowned by the large red Hotel La Aguillas. The difference between the two mounts is that you can drive up to the stunning Hotel Las Aguilas of Puerto de la Cruz but, not up to the summit of the bigger one. The height of Montañeta is about 370 meters. It's real peculiar that Spain's highest peak Tenerife mount Teide 'where the little mountain is looking up to', is only about 10 times taller with its 3718 meters or 12199feet. Coming to think of it, trips to the Realejos Montañeta are ideal from Tenerife North. They are also easier to plan than excursions to Teide. Geological history of Montañeta Realejos. It was this mountain of the Monasterio which caused the harbor called Puerto de Orotava to shrink by volcanic deposits, a very long time ago. How get to Meson El Monasterio Tenerife? See Mount Montañeta of the monk as landmark in areal Orotava Valley and Realejos photos , which show how close it is to Puerto de la Cruz. You can also consult do it yourself maps Tenerife. Look for Carretera 333 to Zamora which take from the town center of the old La Vera country road in la Vera Realejos. Go straight up the hill. Take the turnoff sharp to the right after reading Colegio. The latter is a huge, grey building a private college that overlooks the TF5. It's a school where the Catholic theology plays a big role with kids who study there until they go to university. Most convenient excursion place from La Longuera. By the way, it's only 10 minutes by car and even in walking distance from our best Panorama apartment nearby. In that case you take C/ Castillo from La Longuera and turn left into the old Carretera La Vera. You get to La Vera village after a short drive straight on. There, look out for the Monastery sign on your right. What is up there that so many climb the mountain of the monks nowadays? For more photos and fun please, see a review of Tenerife walking with two Swedish girls' at and, from the never forgotten monk's place into Puerto de la Cruz. Things to do in Tenerife for little children at el Monasterio.